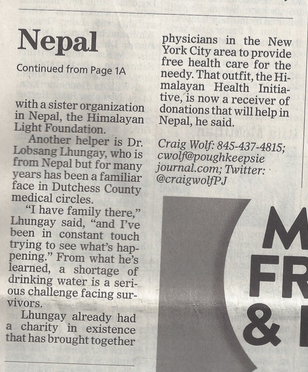 Why Choose Himalayan Light Foundation for Nepal Relief? The recent earthquake in Nepal is perhaps one of the most devastating natural events in the regions history. People's hearts go out to the Nepalese and many wish to show their humanity by helping in one way or another. But with so many choices of organizations and individuals working in Nepal, how can you choose which organization would use your donation most effectively? When you support us, you support a team with unique strengths and advantages on two continents with experienced action, oversight and transparent and regular reporting. We are committed to both short term emergency relief for villagers and the long term reconstruction of Nepal. Bodhivastu will continue to support cultural and heritage preservation through supporting the reconstruction of temples and major heritage sites, while HLF will continue and expand its remote area vital serves provision and philanthropic eco-tourism program called “Solar Sisters” and our famous "Solar Powered Ozone Water Treatment Systems" (SPOWTS) program. This will help to rebuild the travel and tourism industry which will be impaired for some time. HLF will be responsible for delivering and installing solar powered systems to remote villages and homes within our existing and expanded programs. Our local USA and Nepal staff have over 100 years combined experience in remote area and mountain logistics in the very regions we are now focusing on. We have had our hard knocks school training and know what to do and what not to do. This leads to predictable and successful response patterns. We Reach Areas Not Covered by Large Organizations. Since 1997 we having been providing aid in remote areas not normally served by the Nepal government or the larger aid organizations. Our teams have been first wave responders and in many cases, the only responders to some remote villages and towns with populations in the hundreds. That is why UNDP GEF, has consistently chosen us for our most innovative and effective programs that they support. We are a volunteer based organization with extremely low overhead compared to most larger organizations. More of our resources make it to the people who desperately need it. Everything we do is highly leveraged and we make use of your wish to get directly involved by support and even by coming to Nepal. "Learn more coming soon"
We leverage our work by utilizing several alliances we have built over a period of 25 years. We have alliances with volunteer youth groups, and organizations like JICA, United Nations Development Program, Rotary Clubs, UNDP-Global Environmental Facility, (GEF) and several others. Your foreign contributions are highly leveraged by organizations and people from all over the world working together in harmony for the greatest positive impact possible. We are part of the community with family, friends and other long term relationships that allow us to resolve problematic social and political situations that arise in the field. We also have a strong network of Nepalese and Tibetan contacts for information feedback that adds to our understanding of what is really going on at the ground level. We never underestimate ground feedback as an intrinsic part of the process.